After taking note that many major media companies have a cash problem (too much cash), meaning they could look to increase their dividend yields in the interim, it turns out one of the overlooked media companies is already paying an impressive dividend yield. Gannett Co., Inc. (NYSE:GCI) is an international media and marketing company paying a 3.7% dividend yield. Its portfolio includes USA Today and CareerBuilder, which provide solid cash flow for rewarding shareholders, where its return on equity is in excess of 18%. This is most impressive when you consider that major peer Meredith, which pays a 4.1% dividend yield, has a ROE of only 13.8%. After Gannet cut its dividend payment during the height of the financial crisis, it has been steadily upping its dividend of late. Gannett Co., Inc. (NYSE:GCI)’s major peer Meredith engages in magazine publishing, television broadcasting and video creation. Its publishing advertising fell 11% in 2012 and 8% in 2011, but the company’s looking to shift toward digital platforms via strategic acquisitions. This is a similar strategy that Gannett is looking to make. This includes Gannett’s acquisition of Rovion, which is famous for its principal product Ad Composer that facilitates a self-service platform for creating rich media and mobile HTML5 ads. Gannett Co., Inc. (NYSE:GCI) also acquired Mobestream Media and BLiNQ Media to enhance digital marketing. Meanwhile, Gannett also owns the fast-growing career site CareerBuilder. One of the most exciting things about Gannett is its move toward a subscription-based model. Gannett’s fourth quarter 2012 earnings were up over 23% year-over-year thanks to higher television advertising and its subscription-based model. Gannett is also reducing debt, now at $1.4 billion at the end of 2012, while also being able to return impressive cash flow to shareholders via share buybacks and dividends. 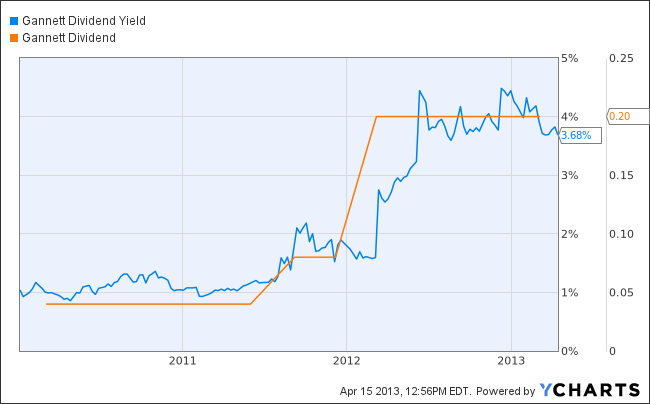 It upped its annual dividend by 150% in early 2012 and announced a new $300 million share buyback program. Going into 2013, Gannett Co., Inc. (NYSE:GCI) had 21 hedge funds long the stock. This includes the top hedge fund owner by market value, Ariel Investments, with a $159 million position in the stock and making up 3.3% of its 13F portfolio. Two other big time global-media companies include News Corp (NASDAQ:NWS) and The New York Times Company (NYSE:NYT) . News Corp operates six segments, including cable network programming, TV and publishing. News Corp’s most talked about catalyst for the interim is the impending spin-off of its publishing unit. The New York Times Company (NYT), Google Inc (GOOG), Microsoft Corporation (... Time Warner Inc (TWX), Salem Communications Corp (SALM): Broadcasting Company... International Business Machines Corp. (IBM), News Corp (NWS): Let’s Not... Gannett Co., Inc. (NYSE:GCI): Are Hedge Funds Right About This Stock? Should You Buy The New York Times Company (NYT)? Google Inc (GOOG): America’s Best Growth Stock: YouTube?